Take a cup of Coming To America and a cup of Black Panther, you have A Princess In Theory. Neledi Smith is a grad student with too much to do, she doesn't have time for scammer emails (which she's been receiving constantly) from somewhere in Africa. So she simply ignores the emails and keeps on with her very busy life. Prince Thabsio also has too much going on. He's a Prince for goodness sake. He's being pressured by his parents to find a wife and is being pressured by his country to take a deal that he knows will be harmful to Thesolo. What he doesn't have time for is to be looking for a woman who was promised to be his since they were children but his ever present assistant Lacose' insists. The Plan...the plan was to simply find Neledi and tell her the truth. The truth about her parents, the connection she has to Thesolo's throne and the country she's never known. But one look at one another and both Neledi and Thabsio are instantly attracted to each other and that carefully laid out plan falls apart as Thabsio finds himself falling for Neledi the more he spends times with her. Neledi has never let anyone get too close to her. Growing up in the foster care system and never have found her "forever home", she learned that no one ever stays...they always leave. Besides her best friend Porsha (whom she keeps a bit at arms length), no one...especially a man has ever gotten as close as Thabsio and he has her wondering if now is a good time in letting the shield that surrounds her heart down. I had fun reading this one because it has both a CTA and BP tease. Neledi and Thabsio were enjoyable characters and their chemistry made for easy reading. Especially Thabsio. I'm so very glad that Ms. Cole made his character as a man who still believed in finding his fairy-tale Princess, it was so cute! 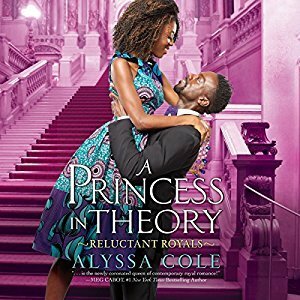 Although at times, parts of the story were a bit long and dragged out, A Princess In Theory is a solid read with characters that are easy to fall in love with even SOME of the secondary ones, lols (hint: Lacose' needs her own book). If you enjoy contemporary fairy-tales, then this is definitely one to pick up. The Narrator: Being that this was an audio-book, I have to give big props to Karen Chilton. She did an outstanding job of voicing all the characters. She seamlessly switched between the characters of Thesolo's African accent back to the gritty twang of America's New York City characters. I enjoyed her voice immensely and I hope to come across her voicing more audio-books in the future. I rated this one 🌟🌟🌟🌟 via Goodreads.